AND RECEIVE YOUR PORTABLE FARMS® KIT: CLICK HERE. The FULL Price List includes the items in the Portable Farms® Kit and what is and also lists what is NOT included. GO TO SECOND BOX ON RIGHT PANEL OF WEBSITE: After providing us with your first name and email address, a link to the price list appears (in two seconds) underneath the box. You may also pay with PayPal, Major Credit Cards and Wire Transfers. If you’d prefer, you may call us to give us your credit number over the phone: 800-906-0256 OR 800-952-6224. We also accept checks, wire transfers and money orders. Shipping and postage are FREE to addresses in the US only, BUT for all order outside the US there is a US$140 shipping and handling charge. can you send me a complete pricelist? i am from mauritius.can i have these items . are the seeds for aquaponics planting different for more productions? Our price list is available on every page of our website. Thank you for your interest in Portable Farms. Price listings for a commercial system. I’m sorry but I am getting very frustrated trying to figure out how to access what is / is not included in a kit and the price list. I have subscribe to the mail list and I’m getting emails….where is the kit information? Laura: I replied in an email to provide you with the information about the Portable Farms Kit. Thank you for pointing out the unfriendly mobile version glitch. We’ll see what we can do to remedy the situation. On the regular page the Price List request form is on the top right. I would like to receive your price list. We try to make receiving the PRICE LIST easy by placing on every page, top of the right hand column, the FREE PRICE LIST box. Enter an mail address, a name, click SUBMIT and voila, up pops the PRICE LIST. Sorry we make it so hard to find. At the top of the right column on every page of our website is a form to request the Price List. Fill in your email address and a first same, hit Submit and voila. A few browsers don’t like the format and on some phones you have scroll down a while to find the form. My Company is situated in Trinidad WI. We have a lot of land 480 feet X 290 feet in size on which I will be constructiing about 10 Commercial Aquaponics Systems in size of 72 Feet X 24 Feet foot print. The reason why I choose that size is because of the constraints and restrictions I have on the land. In addition, the actual footprint of the systems that will be purchased later down the line (say 1 to 2 years from now) will I am sure be larger. I am in the process of grading and installing electricity and water supplies. Constructing the Offices and Security systems. I would appreciate you providing me with a quote for an Aquaponics System (with and without lettuce) that would fit in the footprint size 72 feet X 24 feet. You may quote the greenhouse separately. First we do not sell greenhouses, we do not sell complete systems and we do not do project management. All of this information is covered in the PRICE LIST. Second, the size of the greenhouses you are starting with is tough to work with in order to maximize the coverage in that shape footprint. Using a 30′ x 72′ greenhouse allows for six Grow Table Modules of 6′ x 32′ to be placed inside. The number of PFAS Modules that will fit into the slightly larger size times the 10 greenhouses is the equivalent to two 10,000 sq installation or 1/2 acre. Third, in order to purchase the Portable Farms® Aquaponics Systems you must place your order and pay for it in advance. PFAS LLC will also provide a construction foremen to train your crews in how to build and operate the PFAS Modules. We actually provide the training to you as part of the technology package at a rate of one student/operator per 10 PFAS Modules purchased. The MINIMUM number of PFAS Kits to qualify for the Commercial PFAS package in 20 PFAS Kits. The Price List covers how we sell the PFAS Technology. The cost is very carefully laid out and there are no discounts offered. The best first step is to purchase the Commercial Aquaponics GOLD ebook and complete your marketing survey. The GOLD book covers everything you need to know from concept to shipping production. We make it as easy as possible and hundreds of people receive the PRICE LIST every day. At the top of the right hand column there is a box called something like FREE PRICE LIST. Please enter your email address and a name and, voila! up pops the price list. Hi I am a Christian missionary serving in Northern Thailand – ChiangRai and ChiangMai. We are hoping to teach the poor Thais and tribal people as well as the homeless children and youth on how to learn and get started on Aquaphonics to that they can earn a sustainable income throughout the year and hopefully be able to commercially sell their produce. The local church that we are serving in is currently ministering to the 16 villages in their vicinity. Could you tell me more about your Aquaphonics System Course as well as your price list. We hope to set up a Business-as-Mission social enterprise here so as to offer the citizens from these villages gainful employment, learn a sustainable trade as well as to help each other out in their respective villages. The cold, hard, sad truth about the Portable Farms® Aquaponics Systems is that even though they will raise the best locally grown, pesticide free produce in the world (for the people who can afford to purchase such food), most organizations cannot afford the initial cost. The ‘problem’ is that the capital cost (investment required to install a commercial Unit) is higher than most people understand or can afford, think US$300 to US$350 per m2. The operating expenses are very low, mostly in labor so the ongoing ‘cost’ is very reasonable. IF the initial installation was funded as a gift of some kind AND the majority of the food was sold to the highest priced markets, then the installation might be successful. The ‘interest’ shown on your part demonstrates that you have not read much of the website. The PRICE LIST is available on EVERY PAGE, top of the right side column. To teach the local people AQUAPONICS you will need to use open source information because the Portable Farms® Aquaponics Systems technology is protected intellectual property and cannot be taught except by Aquaponics University. The technology can be demonstrated, but not taught to the locals without the organization possessing the Country Portable Farms® Aquaponics Systems Technology License. please send a price list. We make it as easy as we possible know how to receive a price list. At the top of the right hand column on every page is a box that says “Free Price List and Portable Farms® Kit Content List!” and if you will enter your email address and a name and click SUBMIT, up pops the price list. Free email price list please! Sorry we make this so complicated. The PRICE LIST form is on EVERY PAGE, top of right hand column. Fill in email and name and up it pops. Please notice on the top of the right column on EVERY page of the website there is a box called “Free Price List and Portable Farms® Kit Content List!”. By simply entering your email address and first name, then clicking on Submit voila, up pops the PRICE LIST in a new page. Then you have a price list. Hello; where can your system be purchased in Canada? Do you have a vendor? 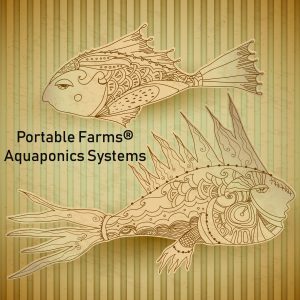 The only way you can ‘purchase’ a Portable Farms® Aquaponics System is by taking the Aquaponics University Portable Farms Aquaponics Systems Course© and the Portable Farms® Kit is included in the course. Once you complete the Course you are pretty much guaranteed that your system will work the moment it is turned on and you will know how to successfully operate it to grow great food forever. We have students all over the world and they all deal directly with us through Aquaponics University. We look forward to having you as a student. I was considering purchasing a system but the price is way out of my league, $2500 seems like a lot when most of the equipment still needs to be purchased. Im hoping your prices eventually come down. There are literally millions of pages on the Internet devoted to aquaponics and you are certainly welcome to put together one or more of those type systems. If you are asking will the Rolls Royce of aquaponics ever be priced as a Yugo, no, that will not happen because the value of the system can never be discounted. You get what you pay for. Please find the system that fits your budget. Some people can afford the finest, and that’s what they buy. For those who want to do aquaponics at a somewhat lower entry level, there are many, many systems that they can choose from and get into aquaponics to see how in can impact every facet of their lives. We trust this helps in some way. Have been researching the aquaponics systenm for a while now and found your website very informative. I will like to set one up in Cameroon West Africa on a commercial scale, starting small then expanding. I live now in New Mexico and would like to start here with a backyard system.Can I grow other types of fish such as catfish, snapper,croaker or red tilipia fish in this aquaponics system? I look forward to your reply.Thanks. Thank you for the kind words. Any warm-water, fresh-water, herbivorous or omnivorous fish will work. You named several salt water species which will not work because the plants do not like salt water. Taking the Aquaponics University Course now is the perfect idea so you have some ‘wet hands’ time before you go commercial. I’m interested in building a greenhouse in my backyard to sustain a family of 5-8 for life. I am interested in better understanding what the $2,500 provides in terms of materials. The PRICE LIST which is available on every page of the website, right hand column, third box down, actually has a complete list of everything in the PFAS Kit and all of the additional materials that you will need to construct your own installation. i am wanting to set up a business in england using 2 30ft wide 90ft long polly tunnel for growing and 1 for the fish ..would that work ?? how much would this cost to the point of operation ? You are welcome to use any setup and any fish/plant combination you would like to try. Be forewarned, there is a huge possibility you will fail unless you us the Portable Farms® Aquaponics Systems. The PFAS is specifically and carefully designed to work anywhere a climatically adapted structure is in place, the operators are trained (as in, has taken the Aquaponics University Course) and the choice of fish and plants are chosen carefully. From your questions it is obvious you haven’t even read much of this website, so after you have done so, you will have those answers. My name is Steen Laursen and I’m a danish man there is living in Ukraine for the last 12 years. And I have been looking in to Hydroponic system and aeroponics, and the last few months I have bin putting my atention on aquaponics. And I have to say that I like this way best, but I will like to get alot more of information from you. And also to get some idea about your service, are you making blueprint projects for pepole, ore are you only make ready projects ??. Can I use the water in aeroponic from aquaponic?? can I use the water in NFT system ???. Can you send me your pricelist so I can see have it is in the financial corner. I’m looking now for the company to help me whit this project, and the size of the project will be 2000m2 from the begining. And the target is to have 1000 salads in week and around 100-150 Kg of green in a week. So I will like you to look in to this and come back to me whit a gos offer. I am a 75 year old optometrist with a small 8′ X 12′ greenhouse in the Boston, MA area in which I have been experimenting with both flood and drain and deep water raft aquaponic systems for about a year. I am convinced that aquaponics has a very significant future but has not yet even had the surface scratched. It is unclear to me exactly why aquaponic systems have not yet been appearing widely all over the world. I would like to be part of this revolution in food production but don’t yet have a business plan. There seems to be a wide variety of favorite approaches to aquaponic systems most of which have not been standardized for modular and expandable development. Portable Farms, however, seems to have the capability to develop the aquaponic movement and become the “Microsoft” of aquaponics. Opportunities exist worldwide but they will not be satisfied without some coordinated business plan. The efforts that I have made in my small greenhouse have served to convince me of the future success of aquaponics and I could attempt to start a small local business but I would prefer to be part of something bigger. Most present aquaponic companies,such as Portable Farms, The Aquaponic Source, and others seem to be in the business of training and selling systems to small customers. I think that aquaponics deserves a more ambitious goal and I think that Portable Farms may be in a good position to work towards that goal. I believe that the Portable Farms turnkey modular systems should be mass produced at low cost and marketed to restaurants, food markets, and individuals especially in cities worldwide. I’m sure you have considered these issues and would be interested in your thoughts and plans for the future. Thank you for the very kind words. Because you have had your hands wet in the technology, you can actually speak with authority, we salute you also. We are also baffled by the slow start to commercial aquaponics and are doing our best to make the implementation of the technology as effortless as possible. The two big stumbling blocks are the lack of track record and the perceived ‘high cost’ on the front end. We have never had a regular farmer purchase one. The main interest is now coming from investors who have never been ‘into’ farming, but are looking for a reasonable ROI and safety for their money. PFAS LLC is focused on providing the backyard people with an package that works the moment it is installed, the components are warranted and that can be installed by competent do-it-yourselves. To this end we have Aquaponics University and the AU Course which includes the PFAS Technology Kit. However our main focus is now commercial installations. There are over 30 projects currently in the pipeline and it appears that in the next year or so the public will be an acknowledgement of aquaponics, as in Portable Farms, as the wave of the future. Interested in the free and instantaneous price list thanks! Every page of the website has the FREE PRICE LIST sign up on the right hand side, second blue box down. You type in your email address and first name and voila, up pops the PRICE LIST. I’m interested in the backyard size system. This website have over 300 pages and all of the information you need is here somewhere. Use the SEARCH box in the top right corner of each page. The Price List is available on EVERY PAGE of the website. Right hand column, second small blue box. You fill in your email address and your first name and voila, there it is. We do not sell or install greenhouses of any type or size. We will install a PFAS system into a climatically adapted structure that you have built to the correct specifications. There are hundreds of greenhouse manufactures in the world. The PFAS in Lagos has a custom build 600m2 building for their system. please provide a catalogue and price list for 1/4 1/2 and 1 acre farms. I tried your icontact marketing submission and it is not functioning properly, so you are next in the chain. Sorry to bother, I want to feed the world and must start somewhere. We moved our whole website to a new hosting company and missed a couple of links on iContact. Sorry. I’ll send you the link in a separate email. hi, i’m interested in starting with a 200sq ft family based system with an eye towards expansion. please provide me with an idea of costing for initial outlay and follow up expansion, thank you. That is a VERY small system if you are wanting to expand. A structure 10′ x 20′ can have two small Modules creating a little over 100 sq ft of grow space. A space of 25 sq ft will feed one adult their table vegetables (not potatoes, carrots and other root vegetables) year round, forever. The cost on a small Unit like that is approximately US$4,700. If you are good with tools and careful in purchasing materials you can do it for about two thirds of that price. To expand in tough on such a small unit. Suggestion: Build as large a climatically adapted structure as you can afford and start with one Module. Then add Modules as you can afford to grow. Make the build wide enough to accommodate a full length Grow Tray (20 to 40 ft long) and then add more in side by side. Several commercial installations are being expanded in exactly that fashion. If you start with a 20′ x 30′ Unit and place the Modules across the 30′ dimension then you can comfortable fit in three large Modules. This way you will have over 300 sq ft of grow space and produce enough for 12 adults giving you some income right away. Even if you could only afford a single Module you would start with 135 sq ft of growing space. Thank you for your inquiry. Under separate cover I sent you the Fact Sheet for a commercial installation for a greenhouse of that size. Twenty Modules will fit nicely into that space so use the figure listed for ten the kits and double it. It appears you already have the greenhouse, if so, then you can ignore the figures noted on the Fact Sheet for a climatically adapted greenhouse. You will still need materials to build the Modules. Do you want to build only a single Unit? or do you want to become the License Holder for your island nation? The first Fact Sheet we sent you is for a site or Expandable license. If you want to build more Units or sell them to others you will need a Territorial License. I also sent you the Territorial License information, again double the cost of the Kits to figure out total cost. The Return on Investment of your money in your area will be less than four years for a PFAS Unit of this size and if you build a second Unit that one will pay itself off is only two years. Please feel free to contact us if you have more questions or want to schedule your installation. I have been doing quite a bit of research on Aquaponics in general, and it has peaked my interest to the point of wanting to start a commercial Aquaponics farm. I did develop a Hydroponics garden for the local community in Costa Rica when I went to school there, but I do not have experience in Aquaponics. I do have potential financial partners for which I am working on a proposal and who would have a potential built-in market. I am hoping you can give me a rough approximate cost for a 1 acre system as well as an approximate yield based on your experience. I do realize that there are many factors involved, but I am hoping to get initial information. I am also in San Diego and if you would be amenable, would be interested in visiting your farm. Thank you for your inquiry. Aquaponics systems are actually easier to operate than most hydroponics systems. The output in covered here. The examples shown are up to 10,000 sq ft which is 1/4 of an acre in slide 25. We now include the Aquaponics Certification Course for FREE with the purchase of a Territorial PFAS Technology License for up to three participant. I have sent you some documents under separate cover that will be very helpful to you and your investors. If a Territorial Portable Farmsâ„¢ Aquaponics Systems Technology License is secured then the initial installation costs are covered in the attached information with is a very close estimate of the costs involved. Please take into consideration that the numbers are for a fully enclosed climatically adapted structure in Southern California. A similar system in Puerto Vallarta, Mexico, where we live, or in Costa Rica the cost will be less. In subsequent installations the licensing cost is not part of the ongoing investment because you will already own the license for the territory and do not need to pay more licensing fees for these new installations. You will have to purchase the PFAS Kits from us, but their cost, as you can see, is considerably less. If you wish to proceed please let us know and we will send you a Non Disclosure Agreement for you to sign, initial and return to us. We will also sign, initial and return a copy to you. At that point we will begin to share more of the information and you will give us some information about your and your project. I’m using aquaponics in a science fair project,could a system be used also with desalination for the use in a third world country? Congratulations on jumping into the forefront of food production in the 21st Century. The answer is ‘yes’ to the use of desalination to provide the water for the Portable Farmsâ„¢ Aquaponics Systems pretty much anywhere in the world. Because the systems use 90 to 95% less water than in-ground growing the water is used much more effectively with virtually no waste. Good luck in the project. Thank you for your inquiry. The PFAS would be perfect for you and your family, however we do not sell individual units outside the US and Canada. We do have Portable Farmsâ„¢ Aquaponics Systems Technology Licenses still available for in many areas including Antiqua. Please see the Technology Licensing page on the website. The amount you want to spend would buy a very nice PFAS Unit for your family. Ronald: Thanks for your inquiry. We offer commercial-sized Portable Farms Aquaponics Systems as well as backyard aquaponics systems. If you’ll let me know your specific needs for growing fish and vegetables, I’ll be happy to give you a quote for one of our systems.